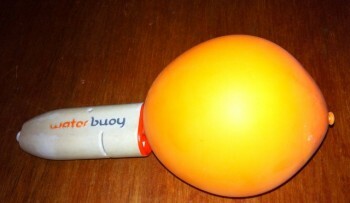 The Christmas before last, my younger land-dwelling brother very considerately bought me a Waterbuoy keyring. This rather nifty little gadget is touted as �the world�s first and strongest intelligent miniature flotation device� for your keys; attach it to your keyring, accidentally drop your keys in the water, and the gizmo will automatically inflate. It holds up to 1kg of weight: more than enough to support your keys in the water. The Waterbuoy even has a built-in light that flashes when it goes off, so you can find your keys at night (and let�s face it, you�re most likely to drop them in on the way back from the yacht club). Sounds great, right? Well, the Dragons from BBC�s Dragons Den obviously thought so � they invested in the business idea, which is why you�ve probably seen the Waterbuoy in every chandlery in the country. I was equally convinced about the concept until one day when I was sat in the saloon on my liveaboard ketch, Milestone, doing some work on my laptop. Out of nowhere, I felt my pocket move slightly against my leg � I thought it was my dog Bosun coming to say hello, but I looked up and he was still sat in the opposite corner of the saloon. And then, all of a sudden, I heard a hissing noise and felt my leg go very cold through the pocket that was wriggling just a second ago. Immediately it clicked � the Waterbuoy attached to the keys in my pocket was inflating! There was definitely no water anywhere near the unit; it had gone off for no apparent reason. I got in touch with the Waterbuoy customer services team, who asked me to send the faulty unit back so they could investigate and help improve future versions of the gadget. Fair enough � they sent me an SAE and I posted it back to them. In return, they sent me a replacement. I renewed my faith in the Waterbuoy and attached the replacement back onto my keyring � phew, I felt safe again. So, can you guess what happened? I think the photo probably gives you a clue. Yep, this one went off too � again, nowhere near any water. This time, the bottom cap of the Waterbuoy had worked itself free a few weeks ago. The inflatable balloon ended up hanging out of the device and, whilst trying to poke it back inside and fit the bottom back on, the whole thing inflated. My faith now non-existent, I�ve decided to bin the Waterbuoy and resort to the old cork ball. Whilst a little more bulky in my pocket, and probably not able to support as much as the Waterbuoy�s touted 1kg of weight, I know it�s got a fail-proof flotation mechanism. And let�s face it, nothing says �I own a boat.� more than a cork ball hanging out of your pocket. What do you rely on to keep your keys safe? Have you ever had to rescue them from the drink? I bought two units for our boat before cruising East Africa. Within a year of purchase they both failed. The first was triggered by falling water. It inflated and burst the balloon! The waterproof camera attached sank to the bottom. The second waterbouy triggered itself in a backpack, no water involved. In this case the balloon also burst. I bought two units for our boat before cruising East Africa. Within a year of purchase they both failed. The first was triggered by falling into the sea. It inflated and the balloon burst! The waterproof camera attached sank to the bottom. The second waterbouy triggered itself in a backpack, no water involved. In this case the balloon also burst. Jelly, I think I have the answer to your predicament, the issue is that Water buoys or GPS enabled Golf Balls have one failing - modern technology. Your story is so amusing it makes me think back to the days of the game twister, flares, boobtubes and hotpants and coming down stairs to find my parents entangled with others attached to car keys and string on a plastic mat called twister. Your predicament has sparked the inovative being within me and I have the solution! On leaving your pride and joy to visit the chandlery or pub of an evening attach your keys to a piece of very long string, the middle bit to your non drinking arm and the other end to your bunk on-board. This serves several purposes, 1. your keys are attached to you and if you fall in the wet stuff - no problem. 2. you have a fail-safe route home even when completely intoxicated or unconcious, others can follow that piece of string right back to your bunk and deposit you there, when you come round much later you will be in familiar surroundings. 3. And this requires full compliance by all berth holders, the string method must be used by all, what fun would we have re-enacting that game of twister at the end of a good bevvy as we all head back to our bunks but need to negotiate that huge ball of entwined string lying on the pontoons. Reminds me of a golf ball I was showing of the other day. Land it in the rough, and a little red flag pops up. In the water, it floats and paddles to shore - like the keys! In the snow, and it'll eject an orange dye. Sandy bunker? No problem, it just changes colour, beeps and sends a GPS signal... It's a very clever golf ball. I don't where you buy it - because I found it. I would think so, Rob - although it's the kind of product you need to be absolutely confident about and able to rely upon. Hehehe, my pockets tend to be cushioned by the handfuls of poo bags I stuff in them for my dog Bosun!